ePublishing Knowledge BaseePublishing Knowledge BaseePublishing Knowledge Base Creating, Managing, and Selling Products How do I use metering, which allows readers to access a set number of articles for free before paying? There are multiple ways to limit access to your content, including requiring a paid subscription or selling it on a per-article basis. A complementary option is to offer metering, where you provide a set number of articles for free before someone is asked to pay or register. This article provides an overview of how to do this. Metering is not set up by default on your website. If you have questions about whether we've activated metering for your website, please contact your solutions manager. 1. Metering is not set up for all websites. Start by talking with your ePublishing Solutions Manager. 2. Your Solutions Manager will turn on metering and set the maximum number of articles allowed before registration or subscription is required. 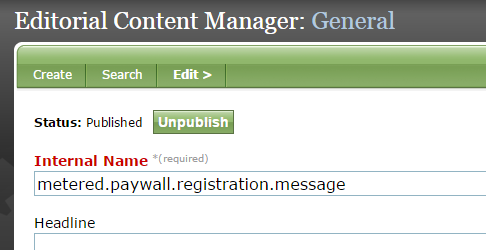 You can set up a timeframe, as well, to set a number of days before the article count resets. 3. Control the upsell messaging that appears to readers by using Editorial Content zones. Access Editorial Content zones under Editorial on your dashboard. A message will slide onto the screen when the reader is accessing articles or blog posts and may include the number of articles he has remaining as well as any custom messaging you would like to add. Which message appears depends on your website's design, as well as the status of that reader. For example, lapsed subscribers may receive a different message than someone who has never subscribed. Note: This will only appear if the article or blog post is NOT tagged as free when created. 4.1. To update the initial messaging, access metered.paywall.registration.message OR metered.paywall.subscription.message in the Editorial Content Manager. Zoom: To update the initial messaging, access metered.paywall.registration.message OR metered.paywall.subscription.message in the Editorial Content Manager. 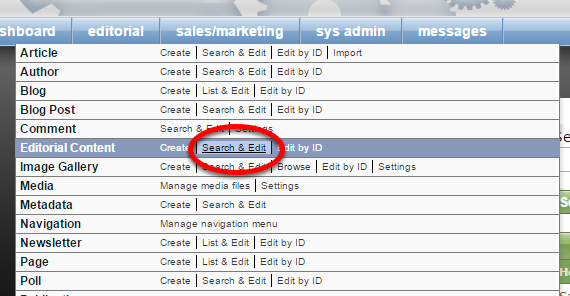 After clicking Search & Edit in your dashboard, navigate to the correct Editorial Content area. Click to view and edit. 4.2. Do *not* change the internal name. 4.3. Under Body, update your message. Zoom: Under Body, update your message. 4.4. Scroll down and click Save. 5.2. Write a message to upsell your reader. Zoom: Write a message to upsell your reader. If desired, some content will remain free to all readers by selecting Free. Again, every website is unique, including taxonomy, so please speak with your Solutions Manager about any questions. Prev: How do I create a product out of an article? Next: How do I create discount codes or offers?